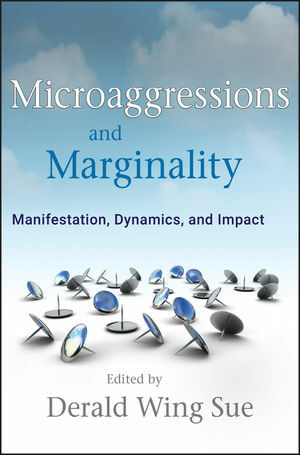 Exploring the psychological dynamics of unconscious and unintentional expressions of bias and prejudice toward socially devalued groups, Microaggressions and Marginality: Manifestation, Dynamics, and Impact takes an unflinching look at the numerous manifestations of these subtle biases. It thoroughly deals with the harm engendered by everyday prejudice and discrimination, as well as the concept of microaggressions beyond that of race and expressions of racism. Edited by a nationally renowned expert in the field of multicultural counseling and ethnic and minority issues, this book features contributions by notable experts presenting original research and scholarly works on a broad spectrum of groups in our society who have traditionally been marginalized and disempowered. Timely and thought-provoking, Microaggressions and Marginality is essential reading for any professional dealing with diversity at any level, offering guidance for facing and opposing microaggressions in today’s society. PART I: MICROAGGRESSIONS AND MARGINALITY. PART II: RACIAL/ETHNIC MANIFESTATION OF MICROAGGRESSIONS. Chapter 2: Black Undergraduates’ Experience with Perceived Racial Microaggressions in Predominantly White Colleges and Universities (Nicole L. Watkins, Theressa L. LaBarrie, & Lauren M. Appio). Chapter 3: Microaggressions and the Life Experience of Latina/o Americans (David P. Rivera, Erin E. Forquer, & Rebecca Rangel). Chapter 4: Racial Microaggressions Directed at Asian Americans: Modern Forms of Prejudice and Discrimination (Annie I. Lin). Chapter 5: The Context of Racial Microaggressions against Indigenous Peoples: Same Old Racism or Something New? (Jill S. Hill, Suah Kim, & Chantea Williams). Chapter 6: Multiracial Microaggressions: Exposing Monoracism in Everyday Life and Clinical Practice (Marc P. Johnston & Kevin L. Nadal). Chapter 7: Microaggressions and the Pipeline for Scholars of Color (Fernando Guzman, Jesus Trevino, Fernand Lubuguin, & Bushra Aryan). PART III: OTHER SOCIALLY DEVALUED GROUP MICROAGGRESSIONS: International/Cultural, Sexual Orientation and Transgender, Disability, Class and Religious. Chapter 8: Microaggressions Experienced by International Students Attending U. S. Institutions of Higher Education (Suah Kim & Rachel H. Kim). Chapter 9: The Manifestation of Gender Microaggressions (Christina M. Capodilupo, Kevin L. Nadal, Lindsay Corman, Sahran Hamit, Oliver Lyons, & Alexa Weinberg). Chapter 10: Sexual Orientation and Transgender Microaggressions: Implications for Mental Health and Counseling (Kevin L. Nadal, David P. Rivera, & Melissa J.H. Corpus). Chapter 11: Microaggressive Experiences of People with Disabilities (Richard M. Keller & Corinne E. Galgay). Chapter 12: Class Dismissed: Making the Case for the Study of Classist Microaggressions (Laura Smith & Rebecca M. Redington). Chapter 13: Religious Microaggressions in the United States: Mental Health Implications for Religious Minority Groups (Kevin L. Nadal, Marie-Anne Issa, Katie E. Griffin, Sahran Hamit, & Oliver B. Lyons). Chapter 14: Microaggression Research: Methodological Review and Recommendations (Michael Y. Lau & Chantea D. Williams).